Earlier this year I read a preview excerpt of this book that I received from NetGalley (click here to read my review) and I absolutely loved it. Then I had to wait about a month to read the rest of the novel because I had a digital copy on hold- and my goodness, it was agony waiting that long! When I finally had access to the entire book I read it voraciously in a single weekend, unable to put it down without thinking about what would happen next. Needless to say, A Darker Shade of Magic did not disappoint! The aspect that first struck me as immensely impressive was the uniqueness of the fantasy world. I would imagine that magic systems are fairly difficult to develop because they have to be interesting and different but logical at the same time, but V.E. Schwab seemed to have no problem creating a system that was complex yet easy to understand. I’ve never read a story in which blood is a literal component essential to performing strong magic, or in which they call people “magicians” instead of wizards, witches, or other names. Not only was the magic system distinctive, but the setting was incredibly unique as well. 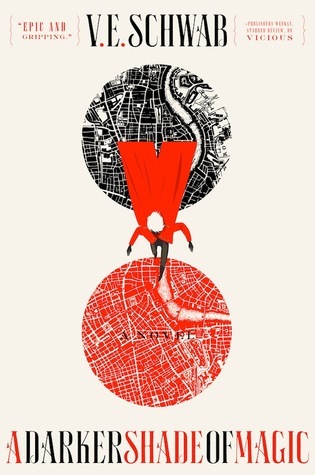 Kell, the main character, lives in Red London where there is magic and a generally stable government in place. Lila, on the other hand, lives in Grey London, which is actually the London in our world because there is no magic. In addition to these two cities there is also the dangerous White London and the forbidden Black London, the latter of which dark magic has taken over. Kell has the ability to travel between these different worlds via portals in the various Londons, but he has to have a token from the world he wishes to visit in order to do so. Magic does not necessarily result in easier lives for the characters, which I believe is akin to saying that possessing power of any kind does not solve all problems. Moreover, I loved how fast-paced and action-packed the plot was, especially considering there was some major world-building going on. I think finding a balance between giving the reader more information and moving on with the story can be tricky, but once again V.E. Schwab nails it in A Darker Shade of Magic. She has this way of being descriptive without slowing down the pace of the action and I just want to sit down with her and have her tell me all of her amazing writing secrets! I don’t know how she did it, but somehow she wrote a book that I seriously could not stop reading. Kell and Lila are fantastic main characters, each for their own individual reasons. I love Kell because he is such a good, reasonable guy. It’s not often that someone with so much skill and power has a decent head on their shoulders (at least in fiction) so his demeanor is really refreshing. Lila, on the other hand, is definitely the louder, more emotive personality of the two. She is strong-willed, independent, courageous, and not afraid to speak her mind or stand up for what she wants. She has a soft side as well, but as far as strong female characters go she is one of the best I’ve read in quite some time. At certain points she is a bit too arrogant for my liking, but given her circumstances I think it’s probably justified. Romance isn’t a focal point of this story at all, but it’s pretty obvious from the beginning that something might eventually blossom between these two. I think they would make a great couple, so fingers crossed! I could go on and on about why I love this book so much, but I don’t want to give too much of the story away. Overall, A Darker Shade of Magic was a phenomenal fantasy novel by an author that I will certainly be reading more of in the future. V.E. Schwab is an incredibly talented writer and I cannot wait to read the rest of the books in this series whenever they are eventually published! Would I recommend it to a friend? : Absolutely! I adore great fantasy novels, and this definitely makes my list of the best ones I’ve ever read. If you’re looking for an exciting, adventurous, enthralling story then I highly recommend that you check this book out! Have you read this book before? What did you think of it? Has V.E. Schwab written anything else that you would recommend? Let me know in the comments section below! < Previous GIVEAWAY: Spring is finally here!! I’ve only read The Archived by her other pen name, but I was not a fan of it. I want to read this, though, because I’ve seen nothing but raving reviews. I just finished this too and loved the uniqueness in the world building and the relationship between Kell and Lila. I’m glad there will be more books in the series, it feels like there is more left to tell in the story. Great review. Good review! I have read many good reviews for this book; I think I will read it. 🙂 Ii like that it sounds descriptive yet not boring. ADSOM got so much hype during the weeks prior, on and after its release and judging from the reviews I think it’s holding up. I wish we have it here in the Philippines already! I agree with you on everything! Since I finished this book I’ve been spending my time on the book website listening to the playlist and taking the buzzfeed test (why do I always get Black London?! I don’t want black London!! 😦 )! This book is so awesome, it gave me a huge hangover! Yes, yes, and yes! Sounds right up my alley! Plus, I’ve been hearing such great things about this book! I’m dying to get my hands on this one!! I’ve never read an adult fantasy before and I’ve not read any of her books yet and ADSOM looks like a good place to start. Great review!